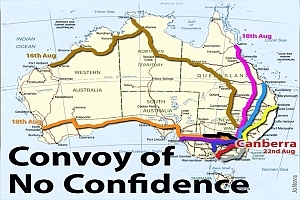 Werner's Cairns blog: The convoy of “no confidence” is heading towards Canberra. The convoy of “no confidence” is heading towards Canberra. It could also be called the “Convoy of Discontentment.” In all my years in Australia I have never seen such a protest against an incumbent federal government. The Australian people, normally very placid have a gut full of the inept Gillard government, not only were they lied to, but they want to introduce an insidious carbon tax for which they have no mandate. A convoy of all sorts of vehicles are travelling from all directions to our National Capital to tell the Gillard Labor/Green government to call an election. FROM what most people understand, the Federal Government proposes to collect the carbon tax from the carbon emitters who will pass the cost of the tax on to us, so it really won't cost the emitters anything. Then the Government will compensate the masses with a tax rebate paid with the money collect from the emitters, so it won't cost us anything either. So, no one will be out of pocket, there will be no change in the amount of carbon emitted, but at least a whole bunch of otherwise unemployable public servants and party comrades will be employed to supervise the transfer of the money between the accounts. It's just like moving a dead body to a new coffin, hoping that it will come back to life. I think I've got it, but you might feel that you need to correct me. But then again save your energy in case someone puts a tax on it. Senator Barnaby Joyce has this to say. Regional Australia is coming to Canberra! The Australian people everywhere you go are starting to have one retort and it is this – can you please get rid of them. In 2009, it was regional Australia that first stood against Kevin Rudd's emissions trading scheme, leading to its eventual defeat on the floor of the Senate. It was regional Australia that last year stood up against a Murray-Darling Basin Plan that was going to destroy the nation's food bowl. And this year it was regional Australia that stood up against plans to end our live cattle trade, notwithstanding the devastation that was caused during the four weeks in which Four Corners ran the country. We do live in a dictatorship now!!! Federal Police are stopping trucks cars and buses from going into the protest and the mainstream media will not show this. All the mainstream media will show is a dud protest with only about 1,000 people protesting. Ann Bressington MLC, reported this on Adelaide's radio station, 5aa this morning. We all live in a Police State NOW!!!! Good article but you miss one important point - the money is not being returned to the 'masses'. It is going only to the poorer people in the community. What we are seeing here is a Socialist agenda, the redistribution of wealth and they are using the Carbon tax as a means of implementing it. This is the worst of the Green's policies.